American orbital launch vehicle. Improved Saturn I, with uprated first stage and Saturn IVB second stage (common with Saturn V) replacing Saturn IV. Used for earth orbit flight tests of Apollo CSM and LM. Status: Retired 1975. 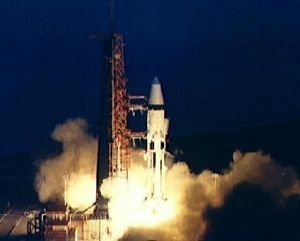 First Launch: 1966-02-26. Last Launch: 1975-07-15. Number: 7 . Payload: 18,600 kg (41,000 lb). Thrust: 7,295.10 kN (1,640,004 lbf). Gross mass: 589,770 kg (1,300,220 lb). Height: 51.00 m (167.00 ft). Diameter: 6.61 m (21.68 ft). Apogee: 185 km (114 mi). In July 1962, when NASA announced its intention to use the lunar orbit rendezvous, the space agency also released details on the two other Saturn vehicles. The three-stage Saturn V was planned for the lunar mission. A corollary decision called for development of an interim vehicle, the Saturn IB, to permit early testing of Apollo-Saturn hardware, such as the manned command and service modules, and the manned lunar excursion module in Earth orbit, as well as the S-IVB stage of the Saturn V. This decision permitted such flight testing a year before the Saturn V would be available. Chrysler's initial contract, completed late in 1962, called for 13 first-stage Saturn IB boosters and 8 Saturn I first-stage boosters. In most respects, the new S-IB first-stage booster retained the size and shape of its S-I predecessor. The upper area was modified to take the larger-diameter and heavier S-IVB upper stage, and the aerodynamic fins were redesigned for the longer and heavier vehicle. 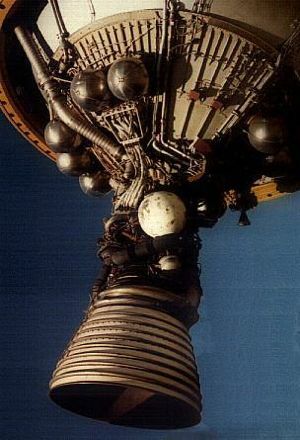 The Saturn IB mounted its eight H-I engines in the same cluster pattern as the Saturn I, although successive improvements raised the total thrust of each engine to 890 000 newtons (200 000 pounds) and then to 912 000 newtons (205 000 pounds). The thrust increase raised the overall performance of the Saturn IB; the performance was further enhanced by cutting some 9000 kilograms of weight from the stage cluster. A more compact fin design accounted for part of the reduction, along with modifications to the propellant tanks, spider beam, and other components and removal of various tubes and brackets no longer required. Additional weight savings accrued from changes in the instrument unit and S-IVB, and the insights gained from the operational flights of Saturn I. Many times, engineers came to realize designs had been too conservative-too heavy or unnecessarily redundant. The production techniques worked out for the Saturn S-I stage were directly applicable to the S-IB, so no major retooling or change in the manufacturing sequence was required. With so few basic changes in the booster configuration, existing checkout and test procedures could also be applied. At Huntsville, appropriate modifications were made to the dynamic test stand to account for the different payload configurations of the Saturn IB and the same static test stand served just as well for the S-IB first stage, although engineers reworked the stand's second test position to accept additional S-IB stages. LEO Payload: 18,600 kg (41,000 lb) to a 185 km orbit at 28.00 degrees. Development Cost $: 1,002.200 million. Launch Price $: 107.000 million in 1965 dollars in 1967 dollars. Stage 1. 1 x Saturn IB. Gross Mass: 448,648 kg (989,099 lb). Empty Mass: 41,594 kg (91,699 lb). Thrust (vac): 8,241.763 kN (1,852,822 lbf). Isp: 296 sec. Burn time: 155 sec. Isp(sl): 262 sec. Diameter: 6.52 m (21.39 ft). Span: 6.52 m (21.39 ft). Length: 24.48 m (80.31 ft). Propellants: Lox/Kerosene. No Engines: 8. Engine: H-1b. Status: Out of Production. Stage 2. 1 x Saturn IVB (S-IB). Gross Mass: 118,800 kg (261,900 lb). Empty Mass: 12,900 kg (28,400 lb). Thrust (vac): 1,031.600 kN (231,913 lbf). Isp: 421 sec. Burn time: 475 sec. Isp(sl): 200 sec. Diameter: 6.61 m (21.68 ft). Span: 6.61 m (21.68 ft). Length: 17.80 m (58.30 ft). Propellants: Lox/LH2. No Engines: 1. Engine: J-2. Status: Out of Production. Comments: Saturn IB version of S-IVB stage. Due to lower payload, 300 kg saving in structure compared to Saturn V version. Due to deletion of restart requirement, 700 kg saving in propulsion system (primarily reduction in helium for restart). Family: orbital launch vehicle. People: von Braun. Country: USA. Engines: H-1b, J-2. Spacecraft: Apollo Lunar Landing, Apollo LM, Apollo CSM, Apollo X, MORL, Orbital Workshop, Apollo LM Lab, Apollo Experiments Pallet, Gemini Observatory, Apollo RM, Apollo Rescue CSM, Skylab, Apollo ASTP Docking Module. Projects: Apollo, ASTP. Launch Sites: Cape Canaveral, Cape Canaveral LC34, Cape Canaveral LC37B, Cape Canaveral LC39B. Stages: Saturn IB stage, Saturn IVB (S-IB). 1963 September 26 - . LV Family: Saturn I. Launch Vehicle: Saturn IB. Apollo mission plans - . Nation: USA. Program: Apollo. Spacecraft: Apollo LM. OMSF, MSC, and Bellcomm representatives, meeting in Washington, D.C., discussed Apollo mission plans: OMSF introduced a requirement that the first manned flight in the Saturn IB program include a LEM. ASPO had planned this flight as a CSM maximum duration mission only. Bellcomm was asked to develop an Apollo mission assignment program without a Saturn I.
MSFC had been asking OMSF concurrence in including a restart capability in the S-IVB (second) stage during the Saturn IB program. ASPO would agree to this, but only if the H-1 engine were uprated from 85,275 to 90,718 kilograms (188,000 to 200,000 pounds) of thrust, resulting in a 907-kilogram (2,000-pound) payload gain. 1963 November 8 - . LV Family: Saturn I. Launch Vehicle: Saturn IB. Uprated H-1 engine for the first stage of the Saturn IB - . Nation: USA. Program: Apollo. MSFC directed Rocketdyne to develop an uprated H-1 engine to be used in the first stage of the Saturn IB. In August, Rocketdyne had proposed that the H-1 be uprated from 85,275 to 90,718 kilograms (188,000 to 200,000 pounds) of thrust. The uprated engine promised a 907-kilogram (2,000 pound) increase in the Saturn IB's orbital payload, yet required no major systems changes and only minor structural modifications. 1965 January 21 - . LV Family: Saturn I. Launch Vehicle: Saturn IB. Requirements for Apollo spacecraft launched by Saturn IB assessed - . Nation: USA. Related Persons: Phillips, Samuel. Program: Apollo. 1965 April 1 - . LV Family: Saturn I. Launch Vehicle: Saturn IB. First stage of the Saturn IB first static firing at MSFC - . Nation: USA. Program: Apollo. The first stage of the Saturn IB booster (the S-IB-1) underwent its first static firing at Huntsville, Alabama. The stage's eight uprated H-1 engines produced about 71,168-kilonewtons (1.6 million lbs) thrust. On April 23, Marshall and Rocketdyne announced that the uprated H-1 had passed qualification testing and was ready for flight. 1965 May 12 - . LV Family: Saturn I. Launch Vehicle: Saturn IB. Thrust of the H-1 engine uprated - . Nation: USA. Program: Apollo. MSFC informed MSC that the thrust of the H-1 engine was being uprated to 1,000 kilonewtons (205,000 lbs), thus increasing the Saturn IB's payload capability..
1965 May 13 - . LV Family: Saturn I. Launch Vehicle: Saturn IB. Mission directive for Apollo-Saturn 201 - . Nation: USA. Related Persons: Phillips, Samuel. Program: Apollo. Spacecraft: Apollo CSM. Samuel C. Phillips, Apollo Program Director, issued the mission directive for Apollo-Saturn 201. The mission would flight-test the Saturn IB and the Apollo CSM..
1965 June 11 - . LV Family: Saturn I. Launch Vehicle: Saturn IB. 1965 June 15 - . LV Family: Saturn I. Launch Vehicle: Saturn IB. 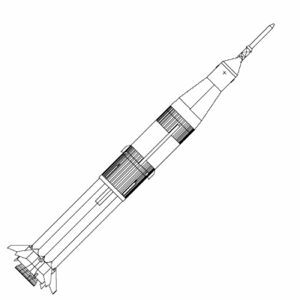 Reduced Apollo Block II service propulsion system for Saturn IB missions - . Nation: USA. Program: Apollo. Spacecraft: Apollo CSM, CSM Block II. 1965 June 17 - . LV Family: Saturn I. Launch Vehicle: Saturn IB. Planned missions for the Saturn IB - . Nation: USA. Program: Apollo. Officials from Bellcomm, MSFC, and the Apollo offices in Houston and in Washington planned primary and alternate missions for the Saturn IB (applicable to SA-201 through SA-208). On July 16, the Office of Manned Space Flight specified launch vehicles (both Saturn IB and V hardware) for Apollo missions. 1965 June 25 - . LV Family: Saturn I. Launch Vehicle: Saturn IB. Col Bolender Mission Director for the first and second Apollo/Saturn IB flights - . Nation: USA. Program: Apollo. NASA announced the appointment of Col. C. H. Bolender as Mission Director for the first and second Apollo/Saturn IB flights. Bolender was assigned to the Mission Operations Organization in the Office of Manned Space Flight, NASA..
1965 June 29 - . LV Family: Saturn I. Launch Vehicle: Saturn IB. No structural changes required for uprated Saturn IB's H-1 engine - . Nation: USA. Program: Apollo. North American reported to MSC that no structural changes to the spacecraft would be required for uprating the thrust of the Saturn IB's H-1 engine from 90,718 to 92,986 kg (200,000 to 205,000 lbs). Effects on the performance of the launch escape vehicle would be negligible. 1965 July 30 - . LV Family: Saturn I. Launch Vehicle: Saturn IB. Performance of the Apollo launch escape vehicle evaluated - . Nation: USA. Program: Apollo. Design a removable device that, while on the pad, would keep the launch escape motor's propellant temperature above 70 degrees. 1966 January 13 - . LV Family: Saturn I. Launch Vehicle: Saturn IB. Land impact program for the Apollo CM Block I deleted - . Nation: USA. Program: Apollo. Spacecraft: Apollo CSM, CSM Block II. A decision made at a Program Management Review eliminated the requirement for a land impact program for the CM to support Block I flights. Post-abort CM land impact for Saturn IB launches had been eliminated from Complex 37 by changes to the sequence timers in the launch escape system abort mode. The Certification Test Specification and related Certification Test Requirements would reflect the new Block II land impact requirements. 1966 February 26 - . 16:12 GMT - . Launch Site: Cape Canaveral. Launch Complex: Cape Canaveral LC34. LV Family: Saturn I. Launch Vehicle: Saturn IB. Apollo 201 (AS-201) - . Nation: USA. Agency: NASA. Apogee: 488 km (303 mi). 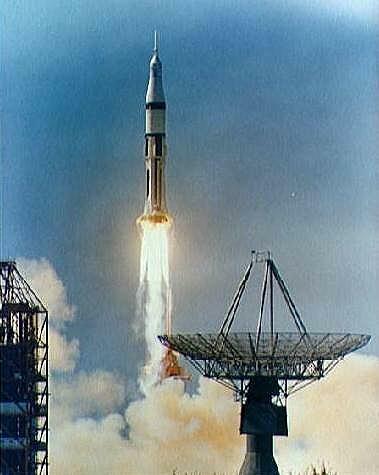 Apollo-Saturn 201 was launched from Cape Kennedy, with liftoff of an Apollo Block I spacecraft (CSM 009) on a Saturn IB launch vehicle at 11:12:01 EST. 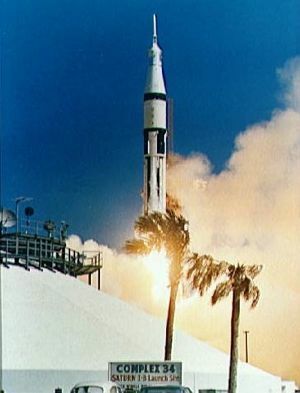 Launched from Launch Complex 34, the unmanned suborbital mission was the first flight test of the Saturn IB and an Apollo spacecraft. Total launch weight was 22,000 kilograms. Spacecraft communications blackout lasted 1 minute 22 seconds. Reentry was initiated with a space-fixed velocity of 29,000 kilometers per hour. CM structure and heatshields performed adequately. The CM was recovered by the USS Boxer from the Atlantic about 72 kilometers uprange from the planned landing point. (8.18 S x 11.15 W). 1966 May 12 - . LV Family: Saturn I. Launch Vehicle: Saturn IB. Changes in Saturn/Apollo nomenclature - . Nation: USA. Program: Apollo. Spacecraft: Apollo LM. lunar excursion module to be called lunar module. Saturn IB to become the "uprated Saturn I." The memo instructed that the new nomenclature be used in all future news releases and announcements. 1967 April 28 - May 16 - . LV Family: Saturn I. Launch Vehicle: Saturn IB. 1967 August 1 - . LV Family: Saturn I. Launch Vehicle: Saturn IB. AS-208 - . Payload: LM-2. Nation: USA. Program: Apollo. Class: Moon. Type: Manned lunar lander. Spacecraft: Apollo LM. Before fire, planned in-orbit test of LM. CSM-101 would dock with and crew would maneuver together..
1967 October 23 - . LV Family: Saturn I. Launch Vehicle: Saturn IB. Minuteman strap-one for the Saturn IB were canceled. - . Nation: USA. Program: Skylab. Minuteman strap-one for the Saturn IB were canceled as part of the AAP. The studies for AAP on the feasibility of the Minuteman strap-one were terminated. .
1968 January 22 - . 22:48 GMT - . Launch Site: Cape Canaveral. Launch Complex: Cape Canaveral LC37B. LV Family: Saturn I. Launch Vehicle: Saturn IB. Apollo 5 - . Payload: Apollo LM-1. Mass: 14,360 kg (31,650 lb). Nation: USA. Agency: NASA Houston. Program: Apollo. Class: Moon. Type: Manned lunar lander. Spacecraft: Apollo LM. Decay Date: 1968-02-12 . USAF Sat Cat: 3107 . COSPAR: 1968-007B. Apogee: 374 km (232 mi). Perigee: 169 km (105 mi). Inclination: 31.60 deg. Period: 89.90 min. NASA launched Apollo 5 - the first, unmanned LM flight - on a Saturn IB from KSC Launch Complex 37B at 5:48:08 p.m. EST. Mission objectives included verifying operation of the LM structure itself and its two primary propulsion systems, to evaluate LM staging, and to evaluate orbital performances of the S-IVB stage and instrument unit. Flight of the AS-204 launch vehicle went as planned, with nosecone (replacing the CSM) jettisoned and LM separating. Flight of LM-1 also went as planned up to the first descent propulsion engine firing. Because velocity increase did not build up as quickly as predicted, the LM guidance system shut the engine down after only four seconds of operation, boosting the LM only to a 171 x 222 km orbit. Mission control personnel in Houston and supporting groups quickly analyzed the problem. They determined that the difficulty was one of guidance software only (and not a fault in hardware design) and pursued an alternate mission plan that ensured meeting the minimum requirements necessary to achieve the primary objectives of the mission. The ascent stage separated and boosted itself into a 172 x 961 km orbit. After mission completion at 2:45 a.m. EST January 23, LM stages were left in orbit to reenter the atmosphere later and disintegrate. Apollo program directors attributed success of the mission to careful preplanning of alternate ways to accomplish flight objectives in the face of unforeseen events. 1968 October 2 - . LV Family: Saturn I. Launch Vehicle: Saturn IB. Check out and launch the remaining Saturn IB vehicle inventory. - . Nation: USA. Program: Skylab. MSFC and KSC officials agreed upon procedures for maintaining the capability to check out and launch the remaining Saturn IB vehicle inventory. Their joint recommendations included a phasedown on contractor activity following the AS 205 launch; deactivation of Launch Complexes 34 and 37 to allow maximum storage of equipment and minimum maintenance on items remaining in place; and continuance of KSC analysis of manpower required to support the AAP dual launch requirement, with contractor participation at the earliest date. 1968 October 9 - . LV Family: Saturn I. Launch Vehicle: Saturn IB. 1969 January 15 - . LV Family: Saturn I. Launch Vehicle: Saturn IB. Management of the Saturn IB project and AAP-assigned spacecraft was transferred from the Apollo program to AAP. - . Nation: USA. Program: Skylab. Management of the Saturn IB project and AAP-assigned spacecraft was transferred from the Apollo program to AAP. This transfer of management responsibility included Saturn IB launch vehicles SA-206 through SA-212 and Saturn IB unique spares and unique facilities. The Apollo program would continue to fund the Saturn IB effort through FY 1969, except for that effort unique to AAP. Beginning in FY 1970, the Saturn IB funding would be an AAP responsibility. This transfer of responsibilities placed management of the Saturn IB project under control of the program that would use it and relieved Apollo management of some responsibilities, allowing more time for concentration on the mainline Apollo program. 1969 August 28 - . LV Family: Saturn I. Launch Vehicle: Saturn IB. Saturn IB AAP launches from LC-37 - . Nation: USA. Program: Skylab. KSC officials and AAP managers recommended to the Manned Space Flight Management Council that the Saturn IB AAP launches take place from LC-37 rather than LC-34. They were incorporating the recommendation into the latest program operating plan proposals. If the recommendation were accepted, LC-34 would be partially deactivated and placed in a 'down- mode' condition. 1969 November 1 - . LV Family: Saturn I. Launch Vehicle: Saturn IB. Study on launching S-IB vehicles from LC-39. - . Nation: USA. Program: Skylab. A major study was performed by KSC, The Boeing Company, and Chrysler Corporation to determine the feasibility of launching S-IB vehicles from LC-39. Major facilities and equipment needed to convert LC-39 to an elevated pedestal configuration were studied, as well as estimated cost figures, program schedules, and interrelationships with other NASA programs. The study indicated that use of the elevated pedestal concept in LC-39 appeared technically and operationally feasible. However, because of the close operational coupling of the Apollo and AAP if this concept were implemented, it was decided to defer further consideration of this concept. 1970 May 15 - . LV Family: Saturn I. Launch Vehicle: Saturn IB. NASA Hq announced that both the manned and unmanned (Saturn IB and Saturn V) launches of the Skylab Program would be from KSC LC-39. - . Nation: USA. Program: Skylab. NASA Hq announced that both the manned and unmanned (Saturn IB and Saturn V) launches of the Skylab Program would be from KSC LC-39. Previous plans were to conduct the Saturn IB launches from LC-34, a part of the U.S. Air Force Eastern Test Range used by NASA, a tenant at Cape Canaveral Air Force Station, Florida. However, program studies showed the feasibility of the pedestal concept of launching the Saturn IB from LC-39 and indicated a cost savings of $13.5 million. The pedestal would be of standard steel structural design; however, there were unique conditions considered. One of these was the requirement to withstand engine exhaust temperatures of 3000 K (5000°F). Another dealt with winds. The pedestal was designed to launch an S-IB at maximum vehicle allowed winds (59.4 km) and to withstand a 200-km per hr hurricane without the launch vehicle. 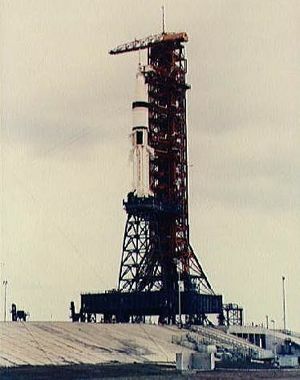 Launch Complex 34, which became operational in 1961, was placed in a standby condition after the Apollo 7 flight in October 1968. It would have required extensive updating of equipment and repairs to ready it for the Skylab Program. 1971 March 5 - . LV Family: Saturn I. Launch Vehicle: Saturn IB. Launch Complex 34/37 Phaseout Plan - . Nation: USA. Program: Skylab. Spacecraft: Skylab. With the issuance of the Launch Complex 34/37 Phaseout Plan, Skylab Program management responsibility- for these two launch complexes was terminated. Although use of Launch Complex 37 for Space Shuttle engine testing had been considered, other options were chosen, and the complexes were to be removed from NASA operational facilities inventory. 1971 March 10 - . LV Family: Saturn I. Launch Vehicle: Saturn IB. MSFC modified a contract with Chrysler Corporation to authorize additional work in the Saturn IB program. - . Nation: USA. Program: Skylab. MSFC modified a contract with Chrysler Corporation to authorize additional work in the Saturn IB program. Chrysler was the prime contractor for the first stage of the Saturn IB, which was assembled at the Michoud Assembly Facility in New Orleans. Under the current modification, the company would maintain nine Saturn IB boosters in storage. Three of the nine vehicles were for the Skylab Program and would be launched in 1973. Those three, plus a fourth that would serve as a backup, would be maintained and modified as necessary under terms of this contract. Prelaunch checkout of the Skylab vehicles would also be accomplished under this modification. The period of performance was from 1 January 1971 to 15 August 1973. Six of the vehicles were located at the Michoud Facility; the other three were at MSFC in Huntsville. 1971 November 26 - . LV Family: Saturn I. Launch Vehicle: Saturn IB. Four S-IB booster stages to be used in the Skylab Program - . Nation: USA. Program: Skylab. MSFC awarded Chrysler's Space Division a contract modification for additional work on Saturn IB launch vehicle booster stages. The contract extension would run through 31 January 1974. The additional work was to refurbish four S-IB booster stages that would be used in the Skylab Program in 1973. The fourth vehicle (SA-209) would be assigned as a backup. All four stages had been in storage for several years. The major portion of the work would be removing the stages from storage, preparing them for delivery to KSC, and providing launch support to them throughout the Skylab launch readiness period, which would end in early 1974. Most of the work would be done at the Michoud Assembly Facility in New Orleans, but some work would be done at MSFC. 1973 February 27 - May 25 - . LV Family: Saturn I. Launch Vehicle: Saturn IB. Skylab 2 spacecraft transferred to Launch Complex 39B in preparation for launch. - . Nation: USA. Program: Skylab. Flight: Skylab 2. 1973 June 11 - July 28 - . LV Family: Saturn I. Launch Vehicle: Saturn IB. Skylab 3 space vehicle was moved to pad. - . Nation: USA. Program: Skylab. Flight: Skylab 3. 1974 February 8 - . LV Family: Saturn I. Launch Vehicle: Saturn IB. Plans for the Skylab rescue capability discontinued. - . Nation: USA. Program: Skylab. Spacecraft Bus: Apollo CSM. Spacecraft: Apollo Rescue CSM. KSC was directed to discontinue plans for the Skylab rescue capability and to move the rescue vehicle (SA-209 and CSM-119) back to the Vehicle Assembly Building. Upon completion of this action, Headquarters responsibility for the SA-209 and CSM-119 would be transferred to the Program Director of the Apollo-Soyuz Test Program.